Get your orders from Galmar Stone-Fist at the Pale Stormcloak Camp. Meet the Stormcloaks east of the fort. You will only be assigned this quest if you chose to give The Pale to the Imperial Legion during the quest Season Unending. Go to the Pale Stormcloak Camp and talk to Galmar Stone-Fist. Galmar will tell you to go to Fort Dunstad and meet the Stormcloaks preparing for the attack. Head northwest and join up with the men east of the fort. Speak to the leader of this force and he will agree to attack as soon as you are ready. If necessary, take a few moments to prepare and then lead the charge up the southeastern road. All Imperial forces must be eliminated. Your journal will keep track of the percentage of enemies left. While a straightforward battle beginning at the front entrance and working into the fort may be preferable for melee fighters, the fort also has several towers which are ideal for archers and ranged attacks. Once the enemy is fully vanquished, head back to Windhelm and Ulfric Stormcloak. He bestows upon you the title of Bone-Breaker and gives you a leveled weapon in honor of this new rank. 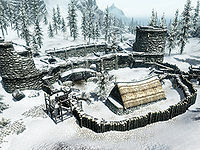 You are now also able to purchase a home in Windhelm. Your next assignment will be the Liberation of Skyrim. 10 Galmar Stone-Fist has sent me to assist in taking Fort Dunstad from the enemy. This page was last modified on 22 March 2019, at 05:29.